Saturday May 28th at 3PM a Chevy Suburban lost control in the parking lot at 3433 State Street and careened into 2 parked cars, ramming one car several feet out of the spot into the car next to it. Then the driver fled the scene. Witnesses called 911 and the vehicle was found later that night abandoned on San Remo. The owner of the vehicle called police later and claimed that he had lent the vehicle to somebody else, who has since disappeared. 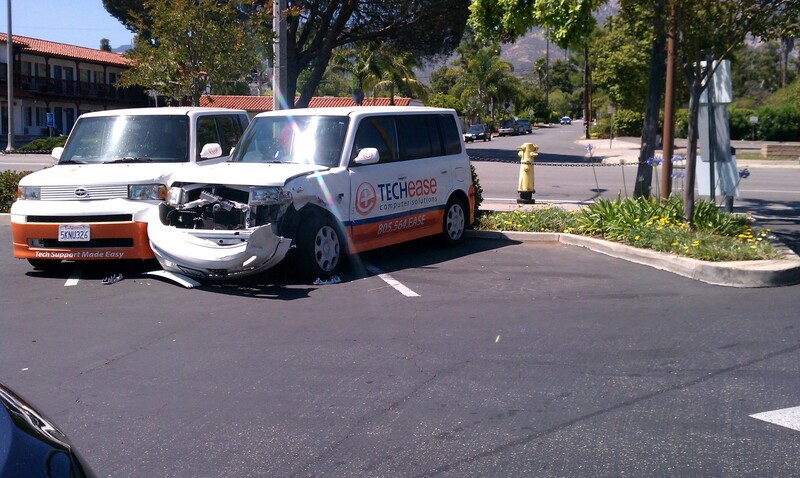 The cars that were hit were fleet vehicles belonging to TechEase Computer Solutions, a local computer support company. 20’ skid marks in the parking lot indicate the driver was completing a U-Turn from one aisle to another, skidded out of control, hopped an island and rammed into the Scion xB parked there, which was then plowed into the vehicle next to it. It is suspected that the driver was intoxicated. For more local coverage see the Noozhawk and edhat.